Third level cleric with a crossbow on Facebook? I meant to post this a few days back when the Hasbro vs. Atari news seemed just a little newer. Hasbro and Atari resolve D&D dispute (News WotC site) I really hadn't realised that most of the D&D PC game titles I own have the Atari logo on the spine, and apparently they're bringing out the new game Daggerdale (official release news). Like many players (I guess), I'm not too bothered about which parent company holds copyright or franchises as long as console and PC games are published regularly and are of a decent quality. In the case of D&D, it's always preferable that computer games include something resembling the actual dice mechanics in the tabletop game. So one naturally hopes that the brand won't be just used to sell first-person fantasy shooters. I don't need graphics of actual d20s being rolled on the screen but I like seeing a character sheet and a get a strange satisfaction with acquiring a ring of "+1 protection" - I'm in a familiar zone. There's always something a bit clunky about those game mechanics being represented in such a dynamic way, like in combat, but I was more than relieved to see that Neverwinter Nights 2 was working out fiddly 3rd edition Attacks of Opportunity for itself. The closest I've come to playing AD&D 2nd Edition was through Baldur's Gate (which I have yet to finish and get on with BG2 - shameful admissions time!). I'm not a MMORPG player - I have gaming commitment issues, so a re-creation of a group experience is not why I play RPG-style games on a PC - it's definitely more to do with structured questing, plausible narrative and the acquisition of stuff. Even with the stunning graphics of Oblivion part of the fun of playing that game was in the stat building. It's amazing to think that on-screen numbers and primitive health bars are still part of the strategy. Turn-based fights seem like an anachronism in games and yet it's still a big part of the genre. Familiar attributes, turn based fights, spell durations - this is all the stuff of tabletop gaming, so sometimes this is the closest a solo gamer can get to exploiting all of their games system knowledge borne from dusty rulebooks. The (Atari) D&D Heroes of Neverwinter (Beta) on Facebook surprised me after playing a previous D&D app (which I've forgotten the name of) which lamely took a reader from one paragraph to the next, with perhaps a combat dice roll. I mean, would a bit of multiple choice been too difficult? At least Heroes' actually has graphics - actual dungeons! They're retro-isometric, too. :) It's a fun distraction, logging in to collect gold and climbing the levels is addictive in a not-quite Diablo way. For a very naive and optimistic moment I thought it might be like a morpy-multi-thingy, but the play-with-your-friends side is all to do with borrowing other people's characters, hence the social pressure to maintain a half decent character. The option to watch your character in someone else's game is interesting in terms of seeing other people's playing style, and the fact that when your character is wounded they my choose not to heal it - the cheek! The sinister financial aspects of the game are a less exploitative than in some Fb games, but who knows, one day, in the middle of the night, at an adventure's zenith, a character revival by cost of diamonds, purchased by Paypal might actually tempt me. It's been a bit stop-start playing the beta - the window can go blank - possibly a problem with server communication (?) and sometimes I've had Flash crashing, which reminded me a lot of the memory leak problems I had with CafeWorld which had nothing to do with the different computers I was using (hmm, Zynga, stop promising the world and telling me to "publish to profile"...). There's been a couple of extra dungeons set up along a Halloween theme - one is so buggy that it crashed three times and when I log back in I'm asked to return to the adventure which then doesn't load. Abandoning an adventure can lead to a loss of hired characters and energy points. Perhaps I've been unlucky, but it can put you off a bit. Seasonal themes are the disease of Facebook games. I assume that designers feel that players easily become bored, so they spice up the games with new backgrounds and special seasonal bonus items. I'm not sure that this is a good idea in the fantasy setting of Heroes, especially if they plan is to slow the game down with multiple welcome notices - perhaps like "Only 2 days left to complete Santas Grotto and defeat the Christmas Trees of Evil" - which is what made Farmville utterly unbearable for me (Gaga-ville was the final straw), that and an emotional attachment to wilting rice crops. I like my fantasy settings to be played fairly straight and have a consistent reality. Neverwinter is a well documented campaign world with it's own seasons and celebrations. I'd be surprised if it's citizens observe pagan or Mexican pre-All Saints Day traditions. I don't mind the spiders, but please, less masks and pumpkins, if you know what I mean. Out of all of the Facebook games I've played so far, I'm enjoying it the most, but I shudder at what extra themes and splash pages they are planning. However, what I really wanted to say is that despite the locations and encounters feeling mechanical and a little limited, I'm enjoying learning some of the very basics of the D&D4 system. Suddenly the new Player's Handbook seems less alien with specific reference to daily- and encounter powers. I'm still not sure why Clerics or Wizards should be allowed hand-crossbows, but for a very small moment I'm having to put my old-edition prejudices aside and embrace the new laws. For anyone still baffled by a "Fey Step" or a "Sly Flourish" maybe Heroes' is a good teaching aid. For now, my preferences are still with older editions of the game, but at least D&D4 combat makes a little more sense now. In way of healing the differences between Atari and Wizards, this game may do a lot for introducing novices to the tabletop game (firmly WotC's jurisdiction), possibly more than a dedicated console or PC game. Facebook app exposure can be massive and egalitarian. 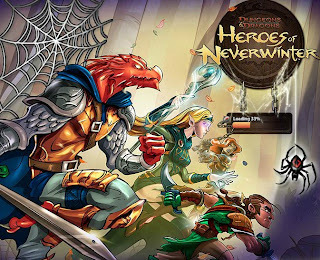 I haven't seen that many good adventure games of Facebook (especially ones where the fights don't look like a card game), so in some ways Heroes of Neverwinter shines. The bad news is that this is a how many people will discover D&D. Apart from the odd scene-setter paragragh there's very little here that resembles the creative magic and wonder of a conversation based role-playing game. But hey, it's amazing that fantasy table-top games still exist at all, even if most of it is just about shunting figures across squares (...says a fan of Warhammer Quest). Perhaps it's a tactile thing, perhaps World of Warcraft isn't the ultimate be all and end all of co-operative games. Given the choice between this and Farmville, I'd opt for heroes of Neverwinter, but then I was a rubbish farmer. ... If you're a Facebooker, check out Heroes of Neverwinter, it's harmless fun (if you can repress thoughts about how D&D is not what it used to be). Sorry it has taken such a long time to get to read this, Billiam Babble, that is an excellent review of the game. I will admit, that I too was a little off about Mages and Clerics using crossbows, but they come in handy when you need to damage a foe, your out of melee range. Of course, that's why mages will always have Magic Missle. Truth be told though, even with crossbows, they never do as much damage as Fighters or Rogues. For those who have not yet played the app, and for those who have, I have been noticing a lot of lag with the game. Not sure if it is on the Flash side of things, or just popularity of the game and their servers can't keep up. In Neverwinter Knights (which uses D&D 3rd ed rules) clerics and mages are aloud to use crossbows. Has that changed now?